ABC Warehouse welcomed more than 150 to its Lakeside store for the regional launch of LG’s new 84-inch 4K Ultra HD Cinema 3D Smart TV. With an MSRP of $19,999.99 and a native Ultra High Def screen resolution of 3840 x 2160, the level of detail of the Ultra HD Cinema 3D Smart TV (Model 84LM9600) quadruples that of the full 1080p HD resolution to a massive eight million pixels. Even before so-called “4K” content is available, LG’s powerful up-conversion engine, the proprietary “LG Resolution Upscaler Plus,” delivers higher detail from current HD/SD external sources. It was debuted at the Consumer Electronics Show in January. Attendees at Thursday’s regional launch had the opportunity to speak with LG representatives and view demonstrations of its latest product to hit the market. In addition to the first 100 people receiving a five-piece wine set, all attendees were entered to win LG prizes, including a Wi-Fi Blu-Ray Player, 3D Home Theater System with Built-In Blu-Ray Player, 42-inch LED 1080P HDTV and a 60-inch 3D Smart HDTV. ABC Warehouse stores are open Monday through Friday from 10 a.m. to 9 p.m., Saturdays from 10 a.m. to 7 p.m. andSundays from noon to 5 p.m. For more information, or to make an online purchase, visit www.abcwarehouse.com. This may be a very preliminary assessment, and my opinion will no doubt change as I test the phone down the line, but from what I saw from the unveiling, the Samsung Galaxy S4 will be the dominant phone in the coming year. The Galaxy S3 came on like a storm last year and severely dented Apple's market share. This year, even with a new iPhone likely coming in the fall, expect the Galaxy S4 to become the dominant phone in the overall market, due to Samsung's continuing innovation where Apple tends to lag. As many people have said lately, iPhones are for teenagers and old ladies, and any person serious about having a top-level phone will look right past the Apple aisle and head to Android -- specifically the GS4 (or perhaps the new HTC One, which is almost as impressive). Blackberry is attempting a comeback, but you can pretty much count them out in this fight. They've fallen too far for a couple new phones to get them back in the hunt, even if those phones turn out to be half-decent. Half-decent isn't good enough these days with superfast behemoths like the GS4 around. So what's all the hype about with the GS4. Samsung is innovating at a level no other phone maker is right now, and that is why they will soon find that the GS4 is the dominant phone in the overall market. There are those who remain loyal to Apple or other brands, but Samsung has done well in part because of its immense marketing budget, which makes it hard to not hear about their new products. Nobody, not even Apple, is as ubiquitous as they are in the world of advertising. I fully recognize that Samsung's competitors will step up their games on new releases later this year. They have to in order to compete with this type of rock star phone. But Samsung has a head start, and the team with the head start usually wins. The BlackBerry Z10 will be available for pre-order starting Thursday March 14 at www.verizonwireless.com/blackberryz10. Customers will be able to choose from two color models, black or white, with white being a Verizon Wireless exclusive. The new BlackBerry 10 platform includes the BlackBerry Hub, a center for communication that streamlines all of a user’s messages, and a keyboard that adapts to their style. Verizon Wireless plans to offer the BlackBerry Z10 and the BlackBerry Q10, two global-ready 4G LTE smartphones running BlackBerry 10, providing customers with more 4G LTE smartphones to choose from. 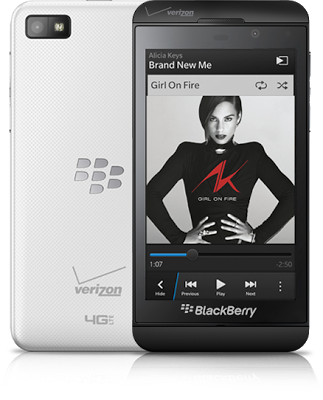 The BlackBerry Z10 will be available for $199.99 with a new two year customer agreement in Black and White color models, with the White model being exclusive to Verizon Wireless. A challenge for many users is managing multiple inboxes including text messages, personal e-mails and social media accounts. BlackBerry Hub helps organize the incoming messages, so users can view and participate in conversations as they happen. Finger gestures on the screen let users easily ‘peek’ into the Hub from any screen, keeping conversations flowing. The keyboard is no longer just about tapping letters on a screen. It’s about how it adjusts to a user’s typing style, whether it’s a rapid or a one-handed typist. It’s about the keyboard understanding what the user wants to say and creating personalized prediction and contextual auto-corrections. BlackBerry Calendar is another feature that understands and adapts to how the smartphone is used. Every time a new appointment or meeting is created, the calendar predicts and suggests who should be invited. BlackBerry Messenger (BBM) users will be able to take advantage of 4G LTE to enjoy innovative BBM video chatting with screen sharing. Co-workers can screen share and review documents and presentations, and friends can chat about things like recent vacations, sharing pictures and video to make it a richer exchange. The Samsung Galaxy Note 10.1 with 4G LTE will be available online and in Verizon Wireless stores starting Thursday, March 7 for $599.99. Users can add this tablet to their Share Everything account for $10 per month. Following a trend started with the Galaxy Note II, the Galaxy Note 10.1 features the advanced S Pen stylus. Business professionals can take notes during meetings with handwriting-to-text capabilities, and drawing tools to jot down plans. Notes can be saved and shared over 4G LTE with coworkers and clients. What makes this tablet different are a couple of features. The first advantage is that it is on the Verizon 4G LTE network. Other features include those found on the Galaxy Note II smartphone. It has a split screen feature that lets you have two apps open at once on the screen. So for example, you can have the browser open with an article you’re reading and your email app to compose or read emails. For photo editing, the Galaxy Note 10.1 runs Adobe Photoshop Touch. Combined with the S Pen™, building visual effects, such as layering, blending and filters, can be used by designers to show drafts or mock-ups to potential clients. Users can combine and manipulate images creatively with the S Pen, then upload work to the cloud using 4G LTE to access their portfolio just about anywhere. Watching television with a second screen has become second nature for many. 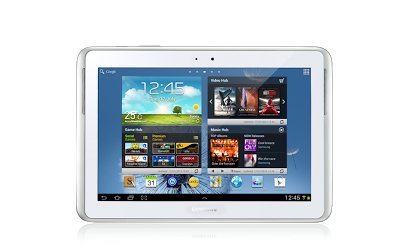 For TV fans, the Galaxy Note 10.1 features the Smart Remote, powered by Peel, to turn the tablet into a universal remote control. The tablet can control an entire home entertainment system and even recommend programs. LIsten to a lot of Pandora Radio? You might be listening a little less, after the company has decided to limit the amount of streaming that people who don't pay a monthly fee will be able to hear. The limit will be 40 hours (and yes, I'm presuming that includes the ads they run quite often during the free streaming). I have to say that this doesn't seem like a wise move to me. I listen to Pandora a lot, and I am willing to put up with the ads, which I see as an alternative to paying the monthly fee and avoiding ads. In a way, I am paying, because the ad money is going to Pandora instead of my monthly fee. But apparently that's not enough for the company. In a way it's not a big deal. If I get to 40 hours and can't listen anymore that month, no big deal. I'll live. There are plenty of other music sources I can use to get my enjoyment. Pandora say that you can pay 99 cents and continue to listen unlimited (with ads) for the remainder of the month once you get to the 40 hour limit, but I would have no desire to do so, just on principle (it's not about the money with a number that low; it's just silly that they're even asking for it). See, that's where Pandora has screwed up. See, they must also realize that if people start to get annoyed with this kind of forced subscription for avid listeners, they will go to other music sources like Slacker Radio, Spotify, etc. And if all of those services follow this business model, I'm sure another company will crop up that does offer free unlimited streaming that is subsidized by ads and not the pockets of listeners. Maybe I'm wrong, but from my vantage point, this won't end well for Pandora, who will lose a lot of listeners and hurt their overall popularity -- while boosting the popularity of their streaming competitors. I hope this email finds you enjoying a favorite Pandora station. I'm writing to give you an important heads up. In an effort to balance the reality of increasing royalty costs with our desire to maximize access to free listening on Pandora, we are implementing a 40-hour per month limit on free mobile listening. Pandora's per-track royalty rates have increased more than 25% over the last three years, including 9% in 2013 alone and are scheduled to increase an additional 16% over the next two years. After a close look at our overall listening, a 40-hour per month mobile listening limit allows us to manage our costs with minimal listener disruption. Less than 4% of listeners will ever hit this limit, but based on your listening it seems that you might. To keep the music you love flowing we have a variety of easy options for you to consider if you reach the 40-hour limit: listen for free as much as you'd like on desktop and laptop computers; pay $0.99 for unlimited, ad-supported listening for the remainder of that month; or become a Pandora One subscriber to get unlimited listening with no advertising. We'll be implementing this change starting in March and will be sure to let you know if you're approaching the limit. As always, your feedback and suggestions are welcome, so don't hesitate to shoot us an email.